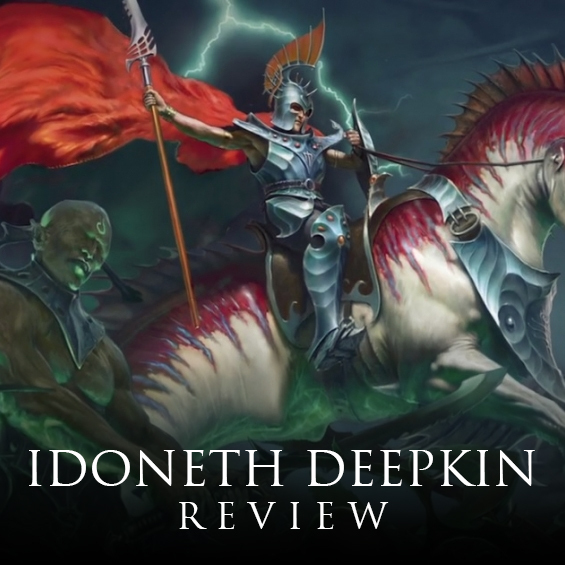 The Idoneth Deepkin have been one of the most anticipated battletomes of late, with aelf fans, and just AoS fans in general clamoring to get a look at them. They definitely rank up there with the Kharadron Overlords as one of the most unique AoS armies to date, so how do the lords of the oceans fare? I'm particularly excited to share this book because it's the first one I got to work on as a play tester. They really are a breath of fresh water into AoS, and a great spin on the aelf aesthetic. The cover art for this one really grabs your attention. To me it almost has the feel of a classical painting. Not so much with the Thralls in the foreground, but with the rearing king and his flowing cape. The juxtaposition between the bright and noble looking king, and the sinister, green lit Thralls really speaks to the dual nature of the Deepkin as an army. I really like this cover, it's definitely one of the stronger ones out there. Once you crack open the book we dive right into the lore. For those who don't know, the Idoneth Deepkin at their most basic are a race of aelves who live in the deepest parts of the oceans of the Mortal Realms and plunder the other races for one resource alone; souls. So, what's the story behind them? During the End Times, while the old world was being destroyed, Slaanesh was devouring all of the elven souls. Mathlann, the elven god of the sea, hid the souls of his followers deep below the oceans and so they were the last eaten by the Chaos god. Once Slaanesh was tracked down during the Age of Myth by Tyrion, Teclis, and Malerion, he was trapped between the realms and through arcane magic, had the souls of the aelven kind he devoured drawn forth. These souls devoted to Mathlann were the first to be brought forth, and in them Teclis sought to recreate the perfect aelves, a race named the Cythai, which loosely means the Awakened. He hoped to rebuild them in the image of the aelves he remembered, but they all had a deep trauma imbedded in their psyche from their time within Slaanesh's belly. Teclis hoped to fix this and showed them "The Light of Reason", but instead of helping them, the Cythai fled from the light. The horrors they had experienced were too much for them to bear and they fled into the deepest parts of the oceans. There, all of their senses, sight, touch, hearing, were dulled. They basically went to a place that blocked out everything so much that they could cease feeling, and hopefully forget the trauma of their past. Their original home was within the oceans of Hysh, but the Idoneth had always been fractious, and the various groups longed to be apart from each other. The very word Idoneth loosely translates as Alone or Isolationist. Once they discovered the whirlways, realmgates beneath the seas, they dispersed across the mortal realms to establish their own enclaves and cities. Here they desired to just be left alone and cut off all contact with the surface world, but it wasn't long before they realized they had a much more massive problem on their hands. Most of the children of the Cythai were born with only half a soul. In this state they were dying very quickly, only lasting several years. Only one in every hundred was born with a full soul. Through arcane arts they discovered ways to steal the souls of other living beings and impart them upon the Namarti, the name they gave to those with withered souls. In this way they were able to extend their lives. At first it was just through the souls of sea creatures, but those didn't help enough, so they began raiding the surface world, stealing the souls of whole villages to ensure the survival of their race. With this, their entire society became structured around their military since the relied upon it for the souls that sustained them. The Idoneth society is divided up into distinct castes. The Namarti form the bottom of it, acting as a labor force, with the most able bodied of them being drafted into the military as Thralls or Reavers. Above them are those with full souls, who either follow the path of the warrior, the Akhelians, or the path of the priest, the Isharann. Unlike in other aelven societies, there's is entirely based upon merit, not bloodline. Two Namartis can have a child who is born with a full soul, while two aelves with full souls can give birth to a Namarti, in this way lineage means nothing. Unfortunately for the Namarti, there is no hope of upward mobility and even with the stolen souls their lives are a fraction of the length of a healthy aelf at only 30 to 40 years. As you can see, they really do a deep dive into the Idoneth history and society. There is a ton more I haven't even talked about yet, like a more detailed look at the paths of the Akhelian and Isharann. The Isharann are particularly interesting since it discusses roles we'll never see models for because they aren't combat roles, like the Embailors, who are responsible for securing the beasts they ride to war. Unlike most aelves, these beasts refuse to form a symbiotic relationship with their riders, and instead must be forced into submission. They also go over some of the major cities, and each major enclave also gets its own page. The Ionrach are the largest of the enclaves, and also the first. They are the least reclusive out of all the Idoneth, and frequently seek to keep contact alive with the other enclaves and are also the ones leading the charge on securing allies from the surface world. The Mor'phann are the most reclusive and hail from Shyish, while the Fuethan are the most impulsive and warlike and make their home in Aqshy. Each of them has a ton of character and backstory to work off of. The timeline for the Deepkin has a bunch of cool little snippets, bridging all the way from the End Times to something called the Necroquake, the grand culmination of Nagash's plans in Shyish. One of my favorite bits in here talks about the first time the Idoneth allied with the Stormcast. In it's simplest terms, they allied with them because they realized their was no way to harvest their souls. If you can't beat them, join them. Something I also haven't mentioned is how the Deepkin are regarded as a myth by most of the other races. Due to their magics, most people forget about the Deepkin as soon as they're gone, so all that's left is an empty town full of soulless bodies and no clue on how it happened. Nagash had some idea that someone was stealing souls, but not sure who until the Skaven burrow up into one of the Deepkin enclaves in a sea and drained out all of the water through their gnaw holes revealing the aelves to everyone. Now that Nagash knows who's to blame I'm not sure things will go well for the Idoneth. We get a formal look at how their military is organized as well, before delving into the individual unit descriptions. The Eidolons, essentially avatars of the god Mathlann, are actually a bit more complex than that. Mathlann is definitively dead, so the Eidolons are actually conglomerates of soul energy from deceased Deepkin that are stored in the hearts of their cities. When they come together they take on the shape of the god they once worshipped. Volturnus is the High King of the Deepkin and the leader of the Ionrach. He's the last of the original Cythai still alive, the others haven fallen in a battle, or a few even from old age. He's the only Deepkin left to have looked upon Teclis before they fled, and carries several artifacts gifted to him be the aelven god. He's also the most active in forming new alliances and bridging rifts between the Deepkin. All of the other units get coverage here as well. There's so much more I could go over, I mean, I haven't even touched upon the Ethersea, the magical "ocean" that surrounds them when they fight upon land, but there's just so much to talk about. Plus, I don't want to ruin all of the surprises for you. Sufficed to say, this is the most fleshed out new faction to come out of AoS yet. They really go over every aspect of them that you could imagine. After all of the lore, we get the section showing off all of the models. While the 'Eavy Metal and studio armies are great, with some really evocative photos, the true star for me is the painting guide section. Here they give us step by step guides for each of the major enclaves, so you can see exactly how to paint them for the table top. They also go over several other tips, like how to paint the Leviadons, and regular, non-Namarti Deepkin flesh. The artwork in this is fantastic throughout as well. My favorite piece is probably one most people have seen, with all the different types of Isharann heroes together and Lotann and his Ochtar behind them. My second favorite is a super stylized version of one of the Akhelian Guards and a Soulscryer. Every piece does a great job at exploring a certain part of the Idoneth Deepkin. Now we're onto the rules. The allegiance abilities for the Idoneth Deepkin have two very important rules, Forgotten Nightmares, and Tides of Death. Forgotten Nightmares makes it so your opponent must always target the closest enemy unit in your army with their missile weapons. This means you can safely hide your more vulnerable units behind something more durable like the Ishlaen Guard. This works even if you take allies since it doesn't specify they have to target the closest Deepkin unit. Put a screen of allies up front and advance the rest of your army behind them unscathed until they get to combat. Tides of Death has a different ability each turn. Turn one all of your units count as being in cover, turn two you can run and still shoot or charge, but not both, turn three all of your units get to fight in combat before any of their units, turn four you can retreat and still shoot or charge, but not both, and then you repeat starting at the beginning again. This can be insanely powerful, especially with the turn three ability, High Tide. If you time all of your charges right you can wipe out a good chunk of their army before they even fight. This is in your turn and their turn as well. Lastly you get access to two Etheric Vortex terrain pieces that you set up before the game begins. As of right now this is just the Gloomtide Shipwreck, which can be set up as one large ship or two small chunks of a destroyed ship. The Shipwreck gives a 6+ ignore wound save to any of your units wholly within 6" of it and can cause mortal wounds to enemy units too close to it. It's not as big of an effect as the Gnarlmaw for Nurgle, but it's still handy. At the very least it's good for board control, and you can plop these right on objectives if you want. The selection of command traits for the army is pretty good, with one that gives you an additional 2 wounds, but my favorite is the Nightmare Legacy. Any enemy units within 12" of your general are at -1 bravery. There's no outright winner here though, and I think we'll see a good selection of these used. 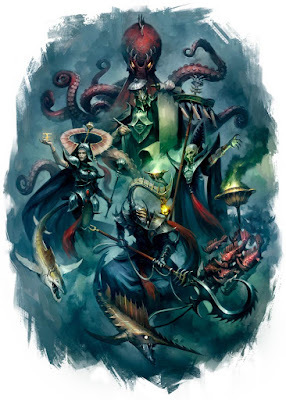 The Deepkin have no shortage of artifacts to choose from, with a table for Akhelian heroes, Isharann heroes, and any Deepkin hero, plus an Arcane table. If you can't find something you like amongst these 24 different artifacts then I don't know what to say. Granted, not every hero can choose from ever table. Kings have two tables to pick from, Soulrenders also have two, while Tidecasters have three potential tables. There are some artifacts across the tables which are slightly similar, but with a little twist on each one. The one I took most often was the Terrorsight Venom, which subtracted one from the Bravery of any unit that was wounded by it for the rest of the game. Sands of Infinity was another good one, which stretches out the effects of a spell even longer. The Deepkin also get their own spell lore of course, with several good spells within. My favorite is Tide of Fear which affects a unit's bravery, but other stand outs are Steed of Tides and Pressure of the Deep. That last one allows you to pick out individual models from a unit to kill them. This is always a great option when you need to get rid of those pesky demon banners or unit champions. The Isharann also have access to three different rituals. These are different than prayers, in that you need to pick an Isharann hero to enact it, then get bonuses to your rolls for other Isharann heroes being nearby or being near a Gloomtide Shipwreck, and on a 10+ the ritual goes off. One of them for example will boost your Eidolons. Before we delve into the warscroll themselves we get three unique battleplans for the Deepkin. All of these revolve around raiding in some way. My favorite has the Idoneth coming on from one of the table edges in the first turn and trying to make it off the opposite side. Another one has markers for "population centers" which one player is trying to defend and get off their table edge, and the Deepkin are trying to raid and pillage. We also get the Path to Glory section which covers all of the stuff you would expect to see in there (no Eidolon in you Path to Glory warband though), plus a unique scenario called The Ship. The map for this one is actually shaped like a ship and has the Deepkin attacking from the ocean. There's a modified version of the map for Skirmish as well. All of the major enclaves get their own rules, with six in total. You don't have to pay any points to use these, you simply pick which one you want. If you painted you army to match one of the enclaves then you have to use that one, otherwise you're free to pick. Ionrach, for instance, gives all wizards +1 to cast and allows any allies in your army to use the Tides of Death allegiance ability. Mor'phan allows your Soulrenders to bring back an additional 3 Namarti models each turn, plus access to a spell called Freezing Mists that prevents an enemy unit from piling in more than 1". Each enclave reflects the realm they fight in a little bit. Fuethan, from Aqshy, plays more aggressively, while Dhom-Hain from Ghur has a bonus to their beasties. We get four Warscroll Battalions in total; three unique ones, a mega one, and a mixed race one. The three regular battalions are the Akhelian Corps, with the eels and Leviadon, the Namarti Corps, with lots of Namarti, and the Royal Council, which is the King, a Tidecaster, and a Soulscryer. I personally like the Royal Council the best. The Phalanx is the mega battalion that combines those three, and then the mixed race battalion, Alliance of Wood and Sea, has the Sylvaneth partnering up with them. This gives all the Sylvaneth in that battalion access to the Tides of Death mechanic, and the Sylvaneth side of it is essentially a Start Collecting box plus one more box of Dryads, so that's pretty neat and tidy. I really wanted to a theme an army around this, but couldn't think up a good list, since the battalion and all the minimum sized, mandatory units in it adds up to about 1,500 points. There are 14 different warscrolls in the army. I'm not going to go into a ton of detail on these since you'll be able to see them all for free soon enough. The main units of the army are the Namrati Thralls and Reavers, and the Akhelian Morrsarr and Ishlaen Guard. The Namrati Thralls can be pretty vicious. They all have two attacks a piece, with a 3+ to hit and a 3+ to wound, -1 rend and 1 damage. On top of that they have a special rule that either gives them +1 attack against one wound models, or +1 damage against models with four or more wounds. That's a whole bucket of attacks that are mostly going to hit and wound. They're a little weak when taking damage, but the Soulrender hero has an ability that can bring some back each hero phase. The Reavers are essentially the ranged version of this unit. They have a little less of a punch, but more versatility in how you can use them. Both of these are great with Soulscryers. I loved ambushing a large unit of Thralls right near the enemy lines. The two eel units both have mobility, but besides that they fulfill different roles. The Morrsarr are your offensive unit. Their spears are -2 rend with 2 damage on the charge, making them especially deadly if you time them right. In contrast the Ishlaen fill a more defensive role, ignoring rend all the time and improving their save to a 3+ on the charge. Couple this unit with the Forgotten Nightmares ability and they can make the perfect screen for the rest of your army, just run everything up behind them. The Allopex is the giant shark like creature. It's a great supportive unit, with moderate combat output and moderate shooting output, but not really great at either. Run them alongside some of the Akhelian Guard though and I think they'll really shine. The Leviadon is the anchor to your line, with the potential for some truly horrendous damage output in combat if you're lucky. 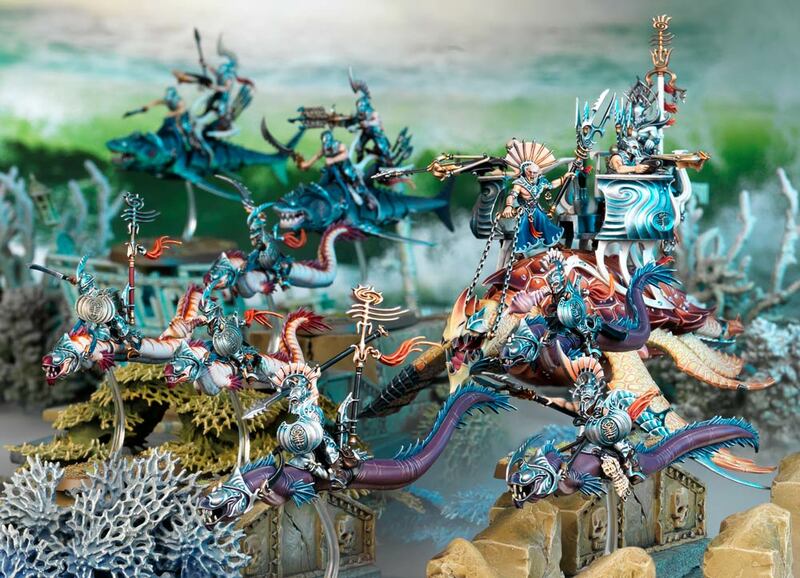 The King and Volturnus are both good, and will probably be a staple in every Deepkin list. The star of the show for the heroes though are the Eidolons, the massive waterfall caped avatars of Mathlann. The Aspect of the Storm is your combat monster, while the Aspect of the Sea is almost as good in combat, but with a wizard aspect incorporated as well. I forgot to mention the Tidecaster and Lotann as well, but like I said, I'm not going to spend a lot of time on these warscrolls, besides, Facehammer will do a better job at it then me. Now, my favorite combo from play testing was taking an Eidolon Aspect of the Sea, a King, and a Tidecaster and using the spells Tsunami of Terror and Tide of Fear coupled with the Nightmare Legacy command trait and the Terrorsight Venom artifact. All four of these affect the enemy's bravery. If you time it all right you can do -4 bravery to one unlucky unit, and -2 bravery to several others around you. I really like this mechanic since it plays into the background of the Deepkin so well, plus there's just something satisfying about messing with bravery that much. 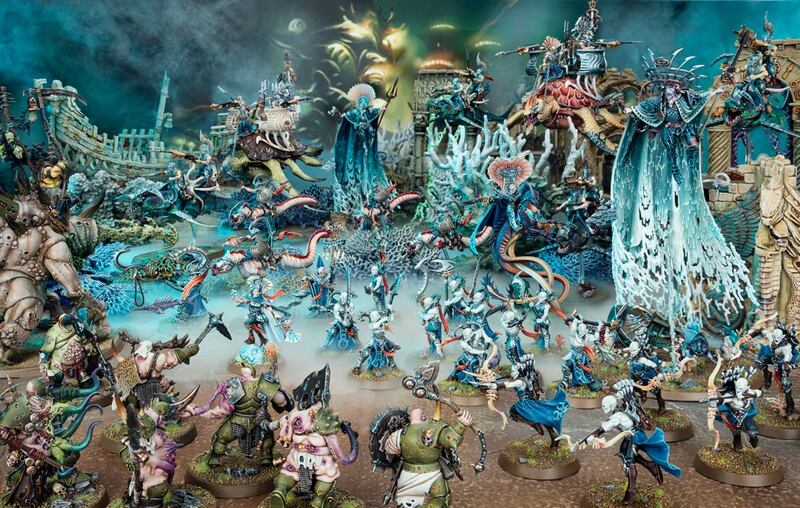 The Idoneth Deepkin are a fantastic new addition to Age of Sigmar and I think will satisfy a lot of hobbyists' aelf itch. Just like the Kharadron Overlords they show a whole new side of the setting, really pushing the boundaries and making a setting that's wholly unique to AoS. The amount of background lore we get on them really breathes life into the army, both on and off the battlefield, which is very important when making a believable race. I mean we get 47 pages of background in the Battletome. That's about one third of the total book. They're no slouch in the game either, with a variety of builds that I think will all be rewarding. You could make a horde type army with a bunch of Thralls or go for a more elite all mounted Akhelian Guard army. Both would do equally as well, and we even get two center piece models with the Leviadon and Eidolon. I haven't even really talked about the quality of the models, which is outstanding. The Thralls are some of the best line infantry I've seen. 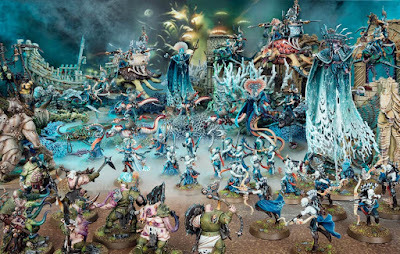 If you're a fan of the background, or just an interested in a well crafted race I don't think you'll be disappointed with the Deepkin battletome.